...but CEPIL wonders if it's not propaganda Yaw Osafo-Marfo, Minister of Finance and Economic Planning, has suggested using funds from the Highly Indebted Poor Countries (HIPC) to resettle the people of Sodom and Gomorrah near the Agbogbloshie market in Accra. The Finance Minister disclosed this when he and the Minister of Tourism and the Modernisation of the capital, Jake Obetsebi Lamptey, undertook a familiarization tour of the Korle Lagoon Ecological Restoration Project (KLERP) on Monday. But the Center for Public Interest Law (CEPIL) is not amused. The Legal Officer of CEPIL, Augustine Niber, told Weekend Agenda that if the Finance Minister promises to resettle the workers, it's an indication that the government is beginning to listen to the concerns of the people. "We only hope they are not doing propaganda, coming immediately after the elections", he said. "The use of HIPC funds is welcome, but it should be targeted specifically at the squatters at Sodom and Gomorrah", Niber suggested. The dredging and restoration of the lagoon drew the government into a protracted legal battle with the residents of the area, who are being dislodged to make room for work to progress. The Accra Metropolitan Assembly (AMA) argues that squatters have no title to the land and should quit or be forcibly ejected. Threats of forceful ejection won sympathy for the squatters, who, with the assistance of the Center for Public Interest Law (CEPIL), sued the AMA and the government for resettlement and compensation. Even though the squatters lost the first round, they have been allowed to hang around until the Appeal Court hears an appeal filed by CEPIL. The impending case, at least for now, gives the squatters some relief. But the government paid a huge price in the just ended elections because of the manner the AMA handled the Agbogbloshie case. The facts are that Sodom and Gomorrah falls within the Odododiodio Constituency and in 2000 the residents rallied to the support of the New Patriotic Party (NPP) then in opposition, leading to one of the biggest political upsets.- the defeat of Nii Okaidjah Adamafio as the MP. Not only was Adamafio's defeat very dramatic, the loss of the seat to a young, hitherto unknown Niibi Ayibonte made all the headlines. Ayibonte was subsequently nicknamed the killer of giants. Four years on, the seat has changed hands. Part of the reason is that a protest vote by the squatters, their friends and relatives made the difference. Some of the squatters recall that in the heat of the 2000 election campaigns, Ayibonte promised to address the many development problems facing them. But after the elections they never heard from him. Instead, one morning they woke up and found their huts and tents cordoned off by armed police and military. They claim that was the beginning of a period of harassment by the security agencies and decided to speak with their thumb. The squatters have been at the receiving end of AMA for ages, with no avenue of addressing their grievances. How important the thumb has become to them. Dejected and poor as they are, the Sodom and Gomorrah squatters have become the king makers of Odododiodio constituency. Works on the KLERP, which started in January 2000, is expected to be completed by July next year. Already 70 per cent of the work has been completed under a fund of 89 million dollars. 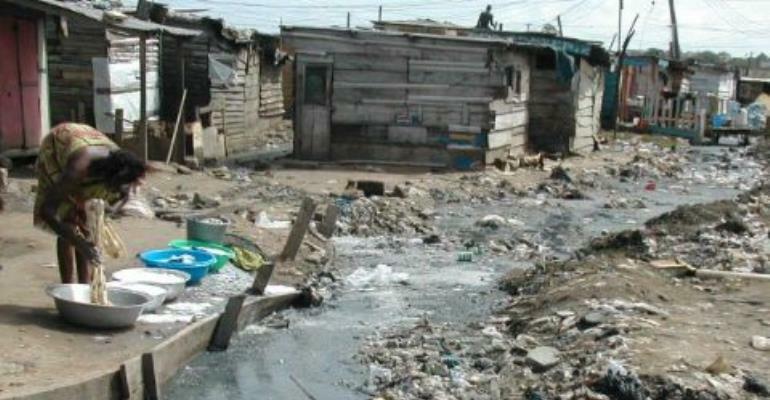 On completion, it would offer substantial improvements to the drainage systems in Accra by way of ensuring efficient floodwater conveyance to the sea, but the inhabitants of Sodom and Gomorrah continue to dump household garbage and other waste into the Agbogbloshie canal and have also damaged part of the completed works, said Danie Terblanche, Project Manager of International Marine Consultancy, one of the companies working on the project.